Genuine Sports and Health Reviews For Your Convienence. The game of hockey is all about contact, that’s why it’s important you find the right shoulder pads and make sure you wear them. Without them, you are tremendously exposed to getting hit and even injured. 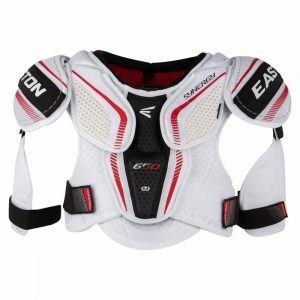 This review will show you exactly what you need to know when it comes to shoulder pads hockey sizing, cleaning, and of course what we think are the best and why. Also be sure to check out our Home Page for more awesome reviews like this one. We encourage you to read this full article because of the value we bring and we believe it can help you choose the right one for you. If you are looking for exclusive discounts and promotions, check out our Hockey Monkey Coupon Codes. So let’s go ahead and begin! So first, I’m going to through some things to be able to find the right pair of shoulder pads for you. If you’ve ever been shopping for pads before, then you will probably know that there are so many different brands and models of shoulder pads. These going from entry-level pads all the way up to high-end premium pads. I’ll try and break these down to see what the differences between the entry-level and more expensive options are. A key thing to bear in mind when buying a new pair is the level you are playing at. If you are taking part in the more aggressive leagues, you are going to need a little bit more protection and higher quality pads compared to the recreational non checking leagues where I think you might be able to get away with a lighter shoulder pad. The position that you play for your team out on the ice is also something I think you might have to take into account when buying new pads. If like me you are a defensemen on your team, you might want to consider getting some beefier or thicker shoulder pads because I feel more comfortable and protected when I’m taking more impacts. I have also found out that this is the case for grinder players who spend a lot of time on the boards or corners doing more checking than scoring, these players will probably prefer some thicker heavy-duty shoulder pad to handle those impacts. Obviously, when you look at thicker more protective pads, the pads begin to get more expensive. This is probably the question that I see getting asked the most because there’s a big difference in the prices of entry level, intermediate and top level pads. So, I’ve done some research to see what the differences are and whether investing that extra amount is really worth the money. I’m going to go ahead and say don’t go cheap on shoulder pads, you can find good shoulder pads for a good price and we will cover those in this review. That’s why we’re here is to help. But if you go wrong with shoulder pads you put yourself at risk and we don’t want that. Also i’m going to tell you to never buy used, and that goes for any piece of protective equipment because you have no idea where that equipment has been, what it’s been through, or how much it’s been used. When you look an entry-level shoulder pad, what you will see most commonly with these is a single panel design in the front and back portion of the pads which includes a plastic insert down the centre for protection of the sternum and spine. This will be reinforced with single density foams on the outer portions. The shoulder and bicep caps will still have that low profile design offering good level of protection but won’t be as thick as some of the higher end models. In terms of liner used for the entry-level pads, I find that they tend to be typically made from traditional brush nylon. Comparing this to intermediate pads, you’ll see some upgrades in this area with a three piece panel design that gives you much more protection and greater mobility. The sternum and spine protection is much thicker in the form of plastic inserts and dual density foams. I also noticed this is the case under the shoulder and bicep guards where you get a little more protection as well as some protection for the clavicle which you don’t get with entry-level padding. What you sometimes see and one I wish they had more of in intermediate pads is the rib wrap. I find it’s a very delicate area and personally a must have for me. The final part is usually a slight upgrade in the liner they use as you get into the more mid-range products as you will start seeing moisture wicking technology. 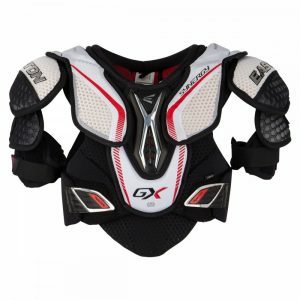 So, let’s get into some advanced pro-end shoulder pads and as you can imagine, these are your ultimate level of protection as well as mobility. You will see the three panel designs from the intermediate pads, but they will be attached by elastic and have some adjustability feature which you can change to how you like fit on your chest. The sternum and spine protection are also so much thicker and have more dense foams to really absorb that impact in these areas. Measuring for shoulder pads is actually pretty easy but is important for proper protection. To figure out the correct size, make sure the centers of the shoulders line up exactly with the center of your shoulder caps. Measure the circumference of your chest right below your armpits. 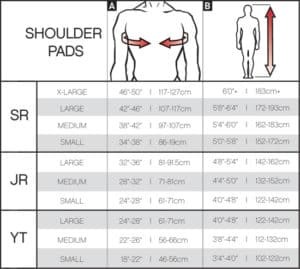 Every chest protector will have a size according to this measurement. Also you can easily adjust the straps of your chest protector for a more custom fit. Below we will display a sizing chart for your convenience. Today we’re going to show you the best shoulder pads you can buy for Beginners and pro stock and brands that supply the shoulder pads. Whether you have problems with the fitting of the pads or the level of protection offered by your current one, we can ensure you that one of the power players will enhance your game. So now let’s go ahead and review the best ice hockey shoulder pads of 2018! So, the Easton Synergy 650 has what it takes to be best in the business. From giving amazing fit to top-level protection to advanced technology these hockey shoulder pads have got everything in it. If we talk about the construction and the material then you are going to see medium density foams almost everything in the pads. These medium density foams are very useful in improving the overall protection and comfort level of the pads. Through the base layer we are again going to see medium density foams that are not only perforated but segmented as well. If we talk about the amazing fit of the pads, then you are going to see Hyperskin Fit that will hug the body with floating protection. The advanced technology of the pads makes it more demanding and professional. The perforated foam base with E-Cell HD floating Arch Frame protection definitely makes this product demanding and of high quality. For the Sternum there is MDP system which is a multi-density protection so this is a couple of layers of medium density foams loaded with the plastic insert segment and for the Spine there is segmented MDP system used as well. This MDP system has really improved the overall protection of the Easton Synergy 650. The way this product is constructed is really good and that’s why the airflow is really good and the breathability factor is impressive too. At the top of the chest, we are going to see extensive pieces that are loaded with the E-Cell HD foam and this HD foam is full of high-density foams with perforated light design and that’s makes this Easton Synergy 650 really lightweight and a high level of lightweight protection. The comfort level and protection of the Easton Synergy 650 is really impressive but at the same time we cannot neglect the great mobility that this product offers. The perforated construction of the pads really ads to the durability of this product. For the Bicep protection there are adjustable biceps and there is Hydrophobic liner used as well. For the shoulder part, there is a hard PE cap that’s molded and it also loaded with medium SD foams for comfort and extra impact protection. Verdict: All around, these are our favorite set of shoulder pads and one that many hockey players will recommend. They feel so lightweight and comfortable with plenty of protection. Considering how cheap they are at the moment, you will not be disappointed either (like this one on Hockey Monkey). Well, the thing that makes the Bauer Vapor X800 different from other pads is their ability to provide tapered fit, reliability, durability and insane protection. If you are a fan of amazing durability then this shoulder pad is definitely for you. The design of the shoulder pads is literally amazing because the way density foams has been used in different parts of the pad is really amazing. Also, the combination of the medium density foams with the PE inserts make the pads really effective and demanding in the ice hockey world. This combination is also very lethal in giving you top level protection and comfort. These shoulder pads are loaded with really amazing and lightweight foams with a multi-segmented design. This will also give you great flexibility and extra freedom of movement as well. The advanced technology used in it is another advantage that you will have. The amazing hydrophobic mesh liner which is a soft to the touch and it will help you in wicking away the moisture. So, you will remain nice and dry during the game and the bad odor and the bacteria will definitely stay away from you. Now if we talk about the protection in the center, then you are going to have medium density foams loaded with the Plastic Inserts which will give you great protection. There is a removable medium density guard as well used for the belly guard. The Velcro Strapping System is also very good and it will increase the overall adjustability and comfort level. There is an added collar as well which is a very nice comfortable feature finding extra comfort all the way around your neck. When it comes to the shoulder, there are thermoformed PE construction which is loaded with the medium density foams underneath this there is a bicep guard extending down from the main body this is another molded plastic piece which also backed by a medium density foam. Verdict: If you are a beginner who is just starting off in the sport, then I would say these are a great entry level set of pads. They are very well cushioned and will leave you feeling protected out on the ice and most of all, they are so cheap (like this one on Hockey Monkey). Well, the Bauer NSX has everything that you need in a fully customizable shoulder pad. The Bauer team has done a great job and the Bauer NSX is loaded with a molded cap for a low profile and this will allow you really great protection and amazing comfort. As far as the construction of the pads is concerned the Bauer team has used the one-piece construction throughout that means everything in it. The 3D plastic insert is there to cover the vital area of your chest and there are medium density foams used as well. You will feel very lightweight as well while wearing this shoulder pad as the construction is well calculated and the material used is of high class. There is a Velcro strap at the bottom of the NSX pads. So, this will give you a really tight fitting and that’s why I personally think the customizable fit of the Bauer NSX pads is really good. Well, the whole Bauer NSX pads is loaded with really good medium density foams which not only increase the protection but also gives durability as well. You are going to get great protection, good comfort and reliable safety from the high energy impact shots. Now if we talk about the side protection and mainly shoulder caps then there is a free-floating shoulder cap. This free-floating shoulder cap is very useful as it will give you more mobility and you can move freely without compromising on the protection. The shoulder caps are loaded with molded plastic insert along with medium density foams which are everywhere in the Bauer NSX pads. 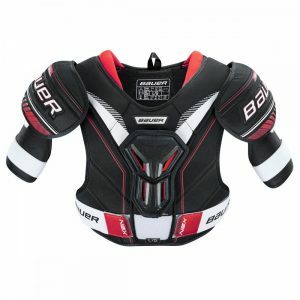 For protection of your neck, the Bauer team has used the comfort padded foam around your neck and this is really increasing the overall protection of the upper body. As said earlier, this NSX pads is all about customizable fit and that goes with the adjustable bicep guard too. This adjustable bicep guard will allow you to move it up or down depending on your size along with the two-inch Velcro strap to help lock it down. Verdict: The Bauer NSX pad is very professional and it really meets the high-quality standard of the professional players. The price range of the pads is really reasonable and you will definitely love the product for its comfortability, customizable fit, better durability and top-level protection (like this one on Hockey Monkey). CCM Jetspeed FT350 Shoulder Pads are really amazing in many ways. You are going to get great comfort, reliable protection and yeah great durability as well. I have personally loved the construction of the pads and also the material of the pads. Even you are a professional player or a rookie this pad is tailored made for you for its amazing features. If we talk about the construction of the shoulder pads, then there is one-piece construction in the front. You will also see molded PE foam in the sternum and you will find everything connected in this one-piece construction of the CCM Jetspeed FT350 Shoulder Pads. The pads are very good because of their amazing protection and being extremely lightweight. The best thing about the pads is the leverage you get in moving while making your shots. The construction of the pads allows you extreme freedom of movement so you can make long strides with ease and comfort. The new designs enhancements and the improved strapping systems are some other notable features that has improved the overall comfortability and protection of the pads. If we talk about the advanced technology then you are going to see the ROCKETFRAMCE COMPOSTIE that has been added in order to increase the mobility, adjustability and also the overall protection of the pads. The pads are very lightweight because of the high-quality foams used in different parts of the pads. You are going to have PE molded caps for good level of protection and also PE foam for lightweight feel and good protection in the Torso section as well. There are thick medium density foams in the bicep guard as well. This will give you an extra layer of protection and comfort against any bumps or hits. The impact protection of the CCM Jetspeed FT350 Shoulder Pads is also very good. In the back of the shoulder there are plastic insert from the clavicle wraparound into the back for spine protection. Verdict: So, overall there is something for every part of the upper body. In short, you are going to get amazing protection, great comfort and pretty good durability for a very reasonable price. 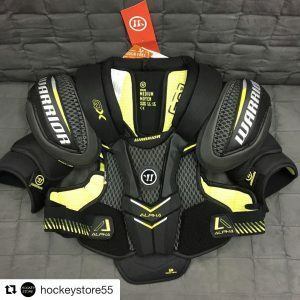 Just a really good set of all round pads which are priced so well (like this one on Hockey Monkey). Our favorite pads on the market right now! A lot of excitement when we tested these as we had done so much research and heard such a buzz about these. So let’s get straight into it. If you see around the torso in the baselayer, you will see E-Cell HD foam all the way around the body. For those who don’t know what E-cell is, it is a high-density foam which is designed specifically for high energy impacts. It’s really amazing as it has so many cool features for example, it is very lightweight and flexible perforated lattice design foam so the air flows straight through the foam itself. 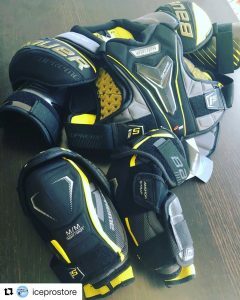 Easton’s E-cell will give you amazing protection, nice breathable fit and it’s really impressive because it’s so lightweight with its construction. We have personally loved this product for its sleek design and amazing breathable fit. You will feel comfortable, protective and drier all the at the same time. At the bottom there is a removable belly guard, which is made up of E-cell foam which is molded with Helix 10. Now we won’t go too much into detail with the Helix 10’s, but it is a very advanced bit of technology designed to protect the body from heavy shots out on the ice as it repels the high energy impacts. Around the sternum area there are various forms of foams and technology that will take the protection of your body to the next level. What really impressed us is how these are all interconnected via an elastic strap which allows the different bits to flex and move freely so it’s applicable for different body shapes and sizes. Getting into the shoulders, there is Easton’s Archframe technology used, which covers the part right across the top of your shoulder. This is in place alongside the molded HD foam on the shoulder cap for further impact protection. Like earlier, we noticed the custom fit around the shoulder area from elastic straps which was very impressive and again great for anyone concerned about general fit. This high level protection continues into the back and along the sides where you get more of the E-cell technology. The Synergy GX is the best bang for your buck and just a fantastic all-round product. Very high level protection while being so lightweight. We found that they also dry super fast after use and this is down to the fantastic breath-ability. You can click here for current pricing on Hockey Monkey. These things are the most high-tech pads on the market! So, this product by Bauer Supreme is special in so many as it has been upgraded on a very large scale. The team has made so many changes to it and it is looking really cool and better than previous products of the company. Well, there is the Curv composite down through the sternum guard. Apart from that there will be Flexorb smart foam that’s on the inside of the pads. So, what does that mean? This will give you more comfort and protection. Their newest addition a closed-cell smart foam called Poron XRD is very special as it can absorb energy impacts of up to 90%. So, you will feel very safe, comfortable and the attacks will hopefully have minimal effect on you. There is an insane amount of protection given to you at the center area and you will be getting high density foam surrounding the main center sternum guard. So, you are getting the complete coverage and besides that there is a three piece design which is patented by Bauer and all these pieces will help you move independently and ultimately allowing you more reach and range of motion. It is a similar case in the back with super protection of the spinal area with the vent armor and high density foams. The three piece system is really amazing as it helps you in so many different situations. There is vent armor foam which is fully perforated giving you an awesome airflow that will keep you nice and dry throughout the game. The breath-ability will be much better as well. The belly guard is adjustable and it has medium density which is very functional and fully removable. The adjustable fit system is new to the Supreme family and gives you custom-tailored fit. We see some new exciting technology in the shoulder pads which came about from the OD1N project and is the way the shoulder caps are molded to fit anatomically correct around your shoulders. It’s very high tech and super impressive. If you thought that was it you then also have the 37.5 liner along with their sanitized odor treatment process which uses your body-heat to evaporate the moisture away and prevent odor causing microbes from forming so increase the longevity of the pads. These are probably the most high tech pads on the market right now and this is reflected in the price. They are for the elite level players but you get what you pay for. You can click here for current pricing on Hockey Monkey. Premium pads but you get what you pay for! 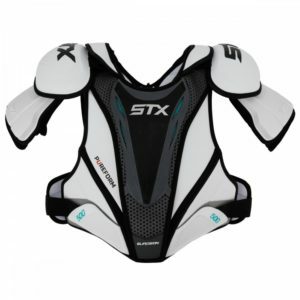 Well, the Warrior Alpha QX shoulder pads are very advanced and Warrior have worked really hard on this product. It is very protective, more comfortable, has supreme fit and excellent mobility. So, you are going to get so much out of it. 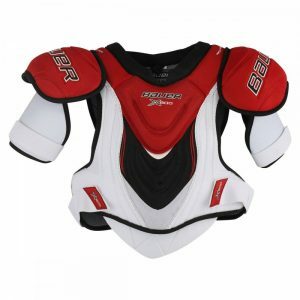 These pads will serve you best as it has all the features that a player needs in a shoulder pad. 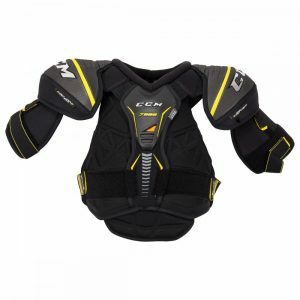 Why Go For Warrior Alpha QX Shoulder Pad? The product uses high quality material which will reduce the weight of the product. Because of the great ventilation system it will make you feel fresh and dry during the game as well. You will feel very comfortable while playing the game. The Warriors have worked so hard on this product and this amazing product is the depiction of their hard work and dedication. The two piece front panel construction with the floating sternum is very helpful in giving you excellent mobility and it will also keep you move freely and execute your shots with long stretches. Apart from good mobility, you will also get good range of motion and protection all at the same time. Down through the center of the sternum guard they have used their top line technology which is VPS. The sternum guard is also loaded with plastic inserts which will make the product lighter and more protection then traditional foams of their previous products. You’ll also notice down the sides of the sternum guard, there’s more high-tech foam designed to disperse energy away from the sensitive areas during impact out on the ice. This high-tech protection continues into the back of the pads making sure the spine is well protected while not feeling so bulky. Because the foam is also well vented, it will give you a little bit better airflow during the game which will help you stay cool and relaxed. But when you put this on, it doesn’t feel bulky at all and it’s super comfortable. There are two full Velcro pads on the front and the kidney pads in the back which allow you to completely adjust how tight or how loose you want the pads to be to give you that personalized fit. On the top, they have used their top of the line smart cap technology. If we talk about the construction of this technology, then it has a plastic piece up top and the closed foam used in which makes it lighter. The 2-timer strap will give you more customize fit to your body and more range of motion which we definitely felt when we put this on. The other amazing feature of the Warrior Alpa QX Shoulder Pad is their Wartech FNC Liner, this strike yellow liner is loaded with Polygiene. So, what it does it will make you nice, dry, clean and odor free. If you are looking for elite- level protection and play on a regular basis, then these are a must have. So lightweight, they almost don;t feel like they are on you. They are on the upper-end of the price range but a worthwhile investment (like this one on Hockey Monkey). The Supreme range are really hot right now! The Advanced Technology – Why These Pads Are Insanely Protective? The MX3 shoulder pads are designed with vent armor used as the base and broken down into segments around the body to give a good wrap. Vent armor technology is a perforated high density foam that is an ideal source of great ventilation keeping the pads cool and dry. Above all it is very ultra protective as well due to its energy absorption properties. The design of the body we feel is so great because of the close to body fit that help players achieve maximum power. The Flexorb technology uses Poron XRD pieces which is extremely responsive and highly protective that is soft and comfortable but also changes form to solidify when hit with a high level energy impact to give a more powerful and optimal level of protection. They are super durable, very protective and will fit your body like a glove. On the bottom you will see wide Velcro tabs giving you good personalization options. The liner on the inside has a 37.5 liner which is designed to change water to vapor faster allowing the vapor to move away from the pad ultimately making the pads drier, more fresh and enhances the overall performance. 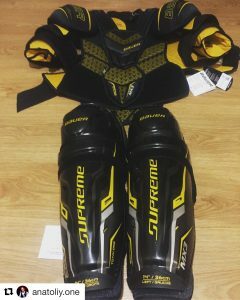 The Bauer supreme products are designed to give you anatomical or natural close to the body fit and that is why they are super comfortable. The bicep has the adjustable free flex construction and it keeps the pad in place because of its sleeve design. Well, here are some of the points that you should this amazing product for your next hockey game. They are super protective and very comfortable. Excellent when it comes to managing energy impacts. Close to the body fit and very comfortable. The Total One MX3’s absolutely awesome! The smaller segmented panels fit around your body like a glove and the high tech makes them light as a feather! You can click here for current pricing on Hockey Monkey. 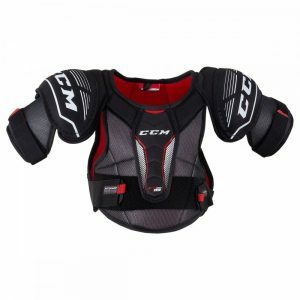 We are with the CCM Tacks 7092 Senior Hockey Shoulder Pads review for you. So, without further due let’s get into it. Well, you will see a two piece pane construction with the floating sternum guard. This will help the pads in moving independently of one another. It will give you full range of motion and amazing protection all at the same time. This is also the case in the back portion of the pads as you get vital protection of the spinal area and down through the sides. The injected sternum guard is pretty standard but what is really exciting is the foams CCM use on top of the guard. It is really amazing when it comes to foams of this product. Well, if you don’t know then keep one thing in mind foams are like the building blocks of any pad. If the quality of the foams and density of it is really good then you are going to get super protection. In this case, you will see these amazing features for sure. You will see the triple density protection in conjunction with the closed cell foam on the top so it doesn’t absorb water. So, you will feel relaxed, comfortable, dry and fresh during the game. The shoulder pad will also remain a little bit lighter through the game, but there is also the D30 lite foam which is known as one of their most protective foams that use in their pads. It makes the product super cool and protective. The greater the force of impact, the more the molecules lock together and the greater the protection. The rate sensitive foam is very cool and the above phrase defines the advanced technology used in the pads very well. You will get the ultimate level of protection and it does an excellent job in dissipating energy away from your body. Through the pads you will see thick medium density foams with this unique triangular 3D design and they work elegantly with the holes on the pads. There is a traditional strapping system and there is a Velcro strap with elastic so you will get a nice fit. There is also an adjustable belly guard at the bottom as well. This high technology continues into the shoulder pads as use their JDP technology again to dissipate energy away from the body on impact. On the top there is also more closed cell foam has been used to increase the level of protection while not absorbing any water. There is a one piece adjustable bicep guard and it is going to be a molded injected plastic which will have a nice fit around the arm. It will allow you to move freely and get the maximum range of motion out on the ice. These are very deserving of their place on the list! The fit is absolutely wonderful and the JDP caps on the shoulder feel absolutely great. We also are a big fan of the logo design which look pretty cool. You can click here for current pricing on Hockey Monkey. Overall, these are lightweight and flexible form fitting shoulder pads that are going to give you great comfort and mobility. HD foams throughout the pads create pro level protection while forming a hydrophobic barrier that will keep you dry and odour free all game long. Breaks in the protective foam system allow you to maintain mobility and flexibility so your game wont be bogged down. The spine plate has a rigid plastic cover that is layered with high density foam over low density foam in order to provide maximum protection. And because the spine plate floats, it’s articulated movements adjust with you. The straps locks into place and this is key because sometimes the jersey can rub against it and knock it loose and come undone while you’re playing but this is going to hold it secure in there the whole time. The new two-layer chest strap system and low profile shoulder caps keep the Surgeon 500 shoulder pads from interfering with your jersey ensuring maximum mobility. Stretch mesh throughout the pad will make sure the Surgeon 500 fits without interference. Overall, apart from the narrowness of the opening at the head, these are a great set of pads and the lightness will almost make it feel like you are not wearing them. If you are interested in finding out how much they are, you can check them out here on Hockey Monkey. We hope you enjoyed the review, be sure to check out our many other reviews like this one. Also don’t forget to check out our other articles, we have tons of great information. And make sure to come back for more awesome content being uploaded all the time! Have an awesome day! Copyright © 2019 What All The Pros Use. All Rights Reserved.